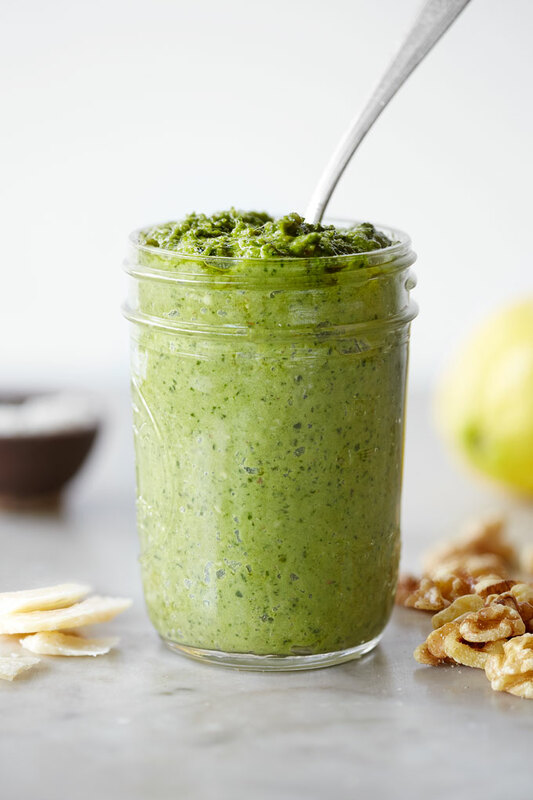 You’re going to love this rich & garlicky pesto made with lemony sorrel & zest! Crisp, lemony Sorrel is one of my favorite salad greens, but it also makes for an incredibly tasty pesto! Better yet, as delicious as pesto can taste, it’s also a great way to pack a whole lot of nutrition into every single bite. 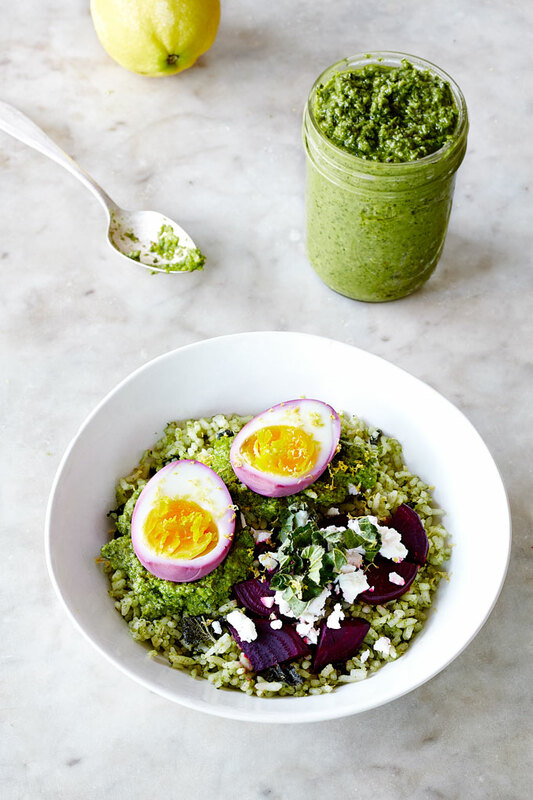 For a super nutritious meal, try my Purple Eggs With Sorrel Pesto Over Nettle Infused Rice! Blending down a big bag of sorrel with walnuts and a couple of other minor ingredients only yields about 12-14 ounces of pesto. That means that every single bite is like a several bites of salad, mixed right in with the good fats and oils needed to help absorb the nutrients. This is good news for those of you with family members who are adverse to greens! 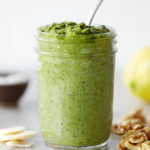 Grounded by the rich flavor of walnuts, this garlicky pesto feels light due to the aromatic finish of sorrel and zest. 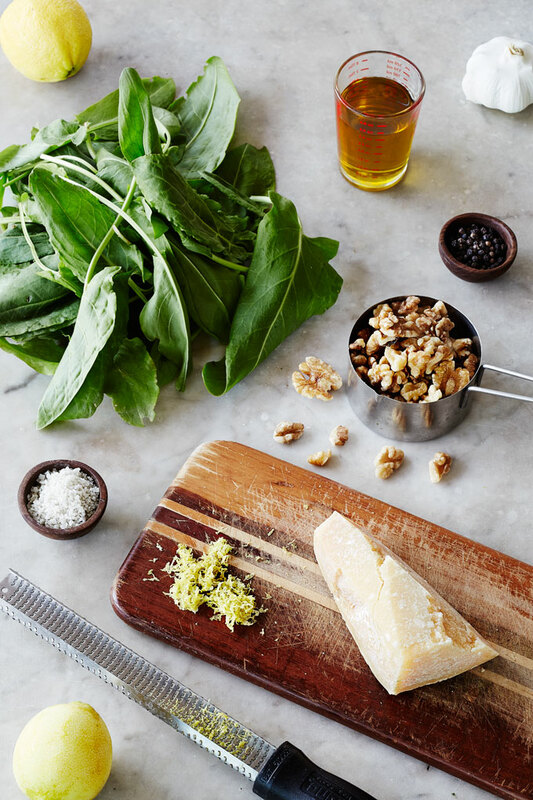 Making it the perfect garnish for spring meals! It can be used to dress up a simple zucchini-pasta dish, or pasta proper of course, it can be served with fish, as a garnish on salad, over soft boiled eggs, or incorporated into cooked grains. Whatever you choose to dress up with this sorrel pesto will finish with zing and become imbued with heightened nutritional benefits! Sorrel, like other less commonly found greens is more nutritious because it has not been over cultivated. It’s packed with vitamin C and rich in B vitamins riboflavin/ B2, thiamin/ B1 and niacin/ B3. It also contains mineral such as phosphorus and iron and healing compounds like flavonoids, oligomeric and polymeric proanthocyanidins. These nutrients make it sorrel a powerful immune boosting food and can even help to treat topical inflammation in compress form. What you want to be cautious of with sorrel, is that it’s especially high in oxalic acid, which is what gives it that wonderful lemon aroma. People who are at risk of developing kidney stones should either stay away from oxalic acid bearing foods or only eat occasional small amounts. Because this pesto recipe is intended as a garnish, you should not have to worry about excessive oxalate exposure, but it is someting to keep in mind when eating high oxalate raw veggies. When it comes to recipes that call for high proportions of nuts and oils, how well the recipe turns out is dependent on the quality of your ingredients. Simply put – get the good stuff and it’s guaranteed turn out outrageously delish! Some cheap parmesan cheeses have a funky taste that will really throw off a pesto. Look for an Aged Parmigiano Reggiano Stravecchio from Italy like the link below. If you’re not sure and you’re shopping at a market with a fairly knowledgeable staff, ask for a variety of parmesan that’s sweet with hints of caramel. Never buy pre-grated cheeses! They are packed with chemical stabilizers to keep the cheese from sticking together and molding. Try your best to get fresh walnuts. Rancid tasting walnuts will put a damper on your pesto. The best thing to do is to avoid bulk bins and buy walnuts that come in well sealed bags. Try my links below for a couple options that may serve you better than hitting the supermarket. This issue is a bit of a tough wal-nut to crack! So I suggest you get Corky’s Nuts! Corky’s Nuts are the highest quality, genuinely fresh source of organic farmer-to-consumer walnuts in the US. As always, if you don’t have a trusted EVOO source and you live in the US, I recommend that you use Bariani Bariani Olive Oil. I promise you will be hooked and never go back. Get the full scoop on the Bariani family and why this is so important by reading my review of Bariani Artisanal Olive Oil. I’m not affiliate, I just want you to have the healthiest and best tasting EVOO! Made with lemony Sorrel and zest this rich and garlicky pesto finishes with zing! It’s the perfect companion to dress up fish, pasta type dishes, rice bowls, eggs and salads. Pop crushed and peeled garlic cloves into the food processor and give it a whirl until minced. Add walnuts and pulse until lightly ground. Add sorrel, salt and pepper and pulse until incorporated. Next run the processor continuously while using the slow drip attachment to add the olive oil, until the mixture becomes a pesto consistency and the olive oil has finished dripping in. Add grated cheese or use the grater attachment to process the cheese with the food processor. Add lemon zest and give it one final whirl or mix with a spoon to incorporate cheese and zest. Transfer to a glass jar to store.